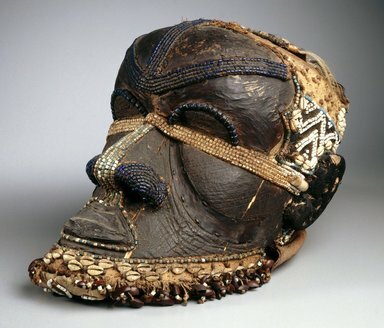 Wooden mask of a bearded human face with cowrie shells and glass beads decorating the surface. Bands of dark blue beads an brow and nostrils. Wide band of white beads and cheeks and bridge of nose. Mixed turquoise and white beads down nose, around mouth and in geometric and chevron paterns on beard and around back of head. Black fur covered leather covers fabric at top of head and chevron pattern of white strips of leather. Undecorated strip of cloth around neckline of mask at back. Beard of white bead rings and enclosed brown seed pods. Cowrie shells and beads in hair of beard. Forehead is round and projecting. There are two rectangular appendages to the chin. CONDITION: Worn. There is a check through the left cheek. Beads and shells are missing throughout. There is a dark brown patina covering the facial area.